Working in the industrial park environment is a dangerous place for oil and gas workers. These on-shore oil and gas industry locations may contain oil refineries, offices, warehouses, and a variety of other related facilities. Additionally, you have oil and gas workers who also operate vehicles, driving products, equipment, and supplies to and from the industrial park. For fleet managers, keeping tabs on all of your employees can be challenging. This is where oil and gas personnel tracking can come in handy through the use of GPS personal tracking devices. This article will address some of the different personal tracking device and software options that exist for oil and gas personnel tracking. These solutions work for employees to carry with them in the field to increase safety. Whether your employees are working inside buildings, at an oil refinery, or are driving transport vehicles, there are GPS personal tracking devices that can meet your oil and gas personnel tracking needs. As technology continues to advance, tracking devices are getting physically smaller with each passing year. RastracGo is our smallest, thinnest, and lightest GPS tracking device to date. Its compact size makes it easy for employees to fit the personal tracking device in their pocket or wallet for safe keeping. Because of its unique size and design that features a loop, the device also can easily be attached to a lanyard or other ID card holder for easy access. Full power management and low power alarm. These features make the GL300VC an ideal personal tracking device for oil & gas workers. If you don’t want to deal with the hassle or expense of investing in purchasing individual personal tracking devices for all of your employees, there is another option. You can use the technology that your employees are almost guaranteed to already have available: smartphones. According to Pew Research Center, the overwhelming majority of people in the United States — 95% — now own a mobile device. Specifically, the research center’s study indicates that 77% of American adults now own smartphones in particular. 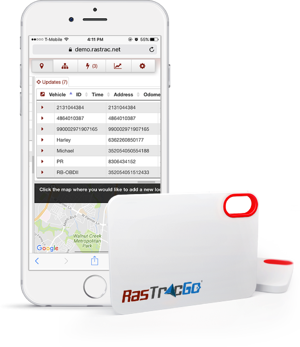 PocketRastrac, Rastrac’s version of a mobile employee location tracking system, is a mobile app that enables fleet managers to track their employees during work hours easily. As long as your employees are running iOS and Android-based smartphones, you can use their mobile devices as people tracking solutions that can be used to locate employees in an emergency. Since 1993, Rastrac has been a fleet and asset management tracking solution for businesses worldwide. Speak with one of our project consultants today to see how our personal tracking devices and software can help you to increase the safety of your oil and gas workers.